Heroes & Cowards is available again! 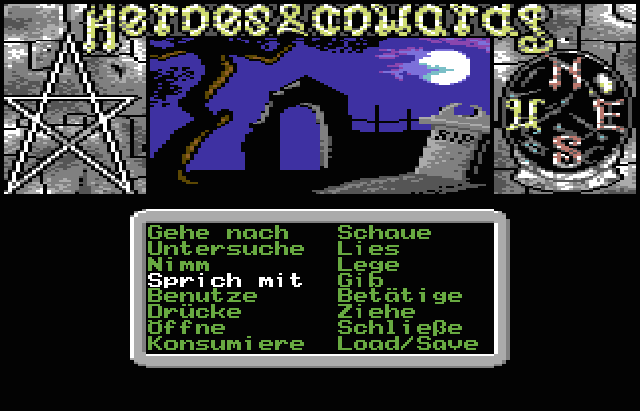 Now it comes in a fully translated (bi-lingual, English and German) Protovision standard box with a thick bi-lingual manual (80 pages) including a Byteriders interview, translucent disk sleeve and a pentagram keychain. He just wanted a comfy-chiller night in front of his TV when our hero was cast into a distant, medieval world by a mysterious force. 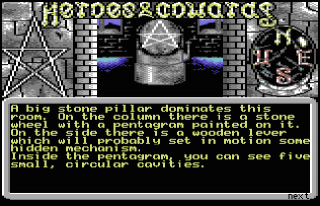 The inhabitants of the cozy little country of Dartenwood were turned to stone by nasty magician Morlon - and only the Pentagram of Power can break the spell. However, its rubies are scattered throughout the land ... All of Dartenwood's hopes are now resting on a chosen one who's supposed to get everything under control. By some inexplicable cosmic twist of fate, YOU'RE supposed to be the one! Your journey from zero to hero includes a whole lot of jeopardies and unsolvable riddles - are you up for it? Are you a hero - or a coward? Over 20 years after their sensational Brubaker, Sebastian Broghammer and Steve Kups celebrate their triumphant comeback on the Commodore 64 in cooperation with Out of Order Softworks and Protovision. 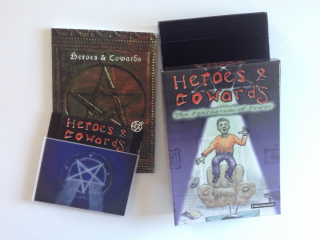 "Heroes & Cowards – The Pentagram of Power" is the adventure maniacs' long lost and eagerly anticipated magnum opus. And what does the media say? 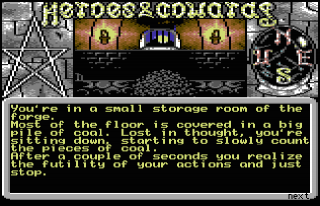 "It’s certainly the C64’s best adventure since the end of its commercial era"
"Highly recommended for both adventure lovers and accessible enough for less hard-core adventurers alike"
"Graphics and sound are both fantastic"
"The interface is incredibly well designed"
Please also have a look at our product page where you can find additional information and system requirements! This Product was added to our catalogue on 18/01/2019.